1) Their impactful undercover investigations are shining a light on the abuse that exists in animal agriculture and dispelling myths about humane farming. 2) Their protests in non-traditional locations and marches throughout the world are causing people to think critically about how their decisions impact animals. These events energize, empower, and mobilize activists and generate positive mass media coverage. 3) They are engaged in dialogue with companies about changing ruthless corporate practices that impact animals. The organization continues to build momentum as a movement, mobilizing activists in 30 different countries and 154 different cities. They have pushed the issue of animal rights into mainstream media outlets such as The New York Times, The Washington Post, HuffPo, ABC Nightline, and many more. In this interview, Wayne Hsiung, the co-founder of Direct Action Everywhere, discusses the rationale behind the organization’s tactics and their vision. You can also learn more by visiting the organization’s website. 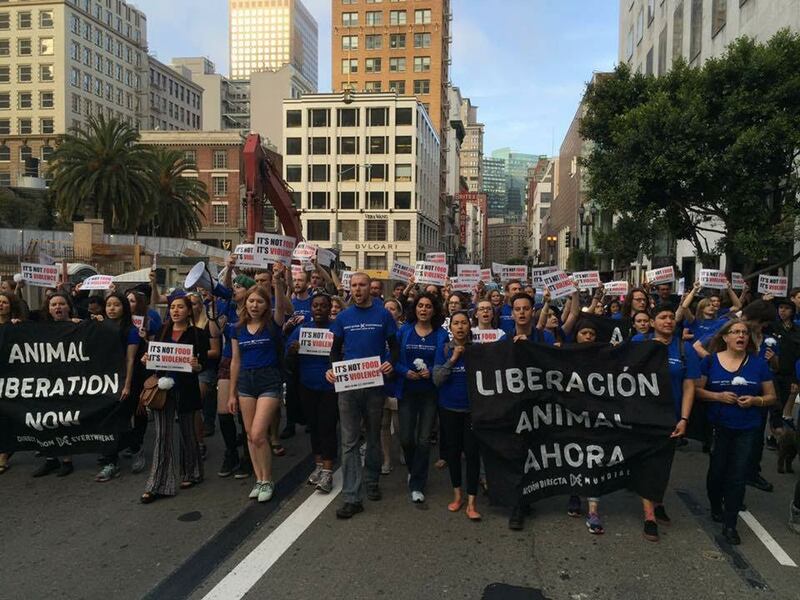 There is a salient argument to be made that this type of public mass mobilization–and it’s growing–could force a tipping point in perceptions, further change consumer behaviors, affect corporate decisions, inspire more consumers to become activists, and pressure the government to expand animal rights. To complete their undercover investigations, they need equipment and assistance covering related expenses. They also need support to pay for legal counsel, one of many costs associated with organizing their events. These are worthy investments given the reach of their videos and their potential influence on corporate practices. Let’s give them the help they need to continue to make an impact for animals. Please click here to donate. First time participating in $5 Friday? so we can inspire others to donate. Let’s make this a huge day for Direct Action Everywhere. The animals are counting on us! I donated $25 to Direct Action Everywhere. Thank you for everything you do to help animals. Thank you for choosing Direct Action Everywhere, Andrew. They are doing very important work. I have donated $100. Thanks so much Andrew. It’s a real honor to receive support from you. Fighting for the rights of unborn babies is also something to fight for!!! Human lives matter!! Should matter just as much, if not more! This is a great idea and we are happy to be part of this effort. Thank you so much, Myrna and Carlos! Donated monthly. Thanks DXE for speaking up for animals in all places, for making activists out of vegans and the wonderful community! Thank you! You will be helping to save lives! Became a monthly $45 donor! That’s wonderful, Zach! Thank you! Marilia, that is so awesome! Thank you very much for your generosity! You are helping to save lives! I don’t use PayPal, but I donate to DXE because it is clear they are making a difference. I’ve made several independent donations. Thanks, Kirschners Korner, for thinking of DxE. Thank you, Peggy! Your donations will continue to save many animals! I am becoming a $20 monthly donor. Thank you so much for featuring Direct Action Everywhere! Thanks so much, Rachel! Your donation will help many animals! Thanks so much for choosing us. It’s truly an honor, and the money will help us save lives and get animal rights into the media! I agree, Wayne. It is indeed an honor, and the donations will go a long way towards helping animals! Your commitment to the well-treatment of sentient beings is admirable. It is our capacity to suffer that defines us. Peace to the people, planets and animals. I am donating to Direct Action Everywhere because I am tired of waiting for animal liberation. Direct Action Everywhere is on the fast track to making animal liberation a reality. Whatever we choose we choose for all humankind. Choose well. Peace to the people, the planet and the animals! There is nothing more important than animal liberation. It impacts us all. I donated and will continue to be a voice. Until every animal is free! Thank you, George! Until every animal is free. Yes indeed! I only wished I had the money. $5.00 isn’t much I know. I believe DxE is the best in getting the message out. I am forever grateful for all the people who work so hard to get this message out. Until every animal is free. Love and peace. Thank you, Marilyn. Love and peace to you, too! Donating $25 to DXE – thanks Kirschner’s Korner for your support! Thank you for your support of this week’s $5 Friday pick. 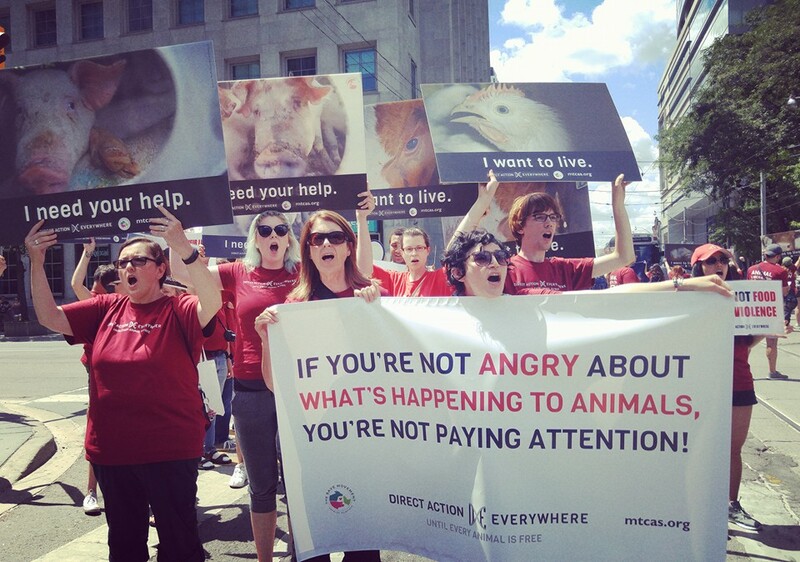 It was a huge day for Direct Action Everywhere thanks to your generosity and concern for animals. We will post a total here tomorrow. Amazing teamwork! That’s wonderful, Andrew! Thank you so much for choosing Direct Action Everywhere. Many animals will be helped as a result! It is with a giant smile on my face that I share the results of the $5 Friday event for Direct Action Everywhere. Before I do, I want to recognize someone special. For the past two weeks in preparation for the event, I emailed and called Almira Tanner dozens of times. Whatever I asked for, she gave me (and I asked for a lot). I found her to be professional, organized, informed, passionate, sincere, and just sensational. I am so impressed with Almira. The organization has a star in her! It is largely the result of her leadership (and many others behind the scenes) that we had such a successful event. Thanks to your generosity, you donated a total of $5,145 to Direct Action Everywhere in one day! 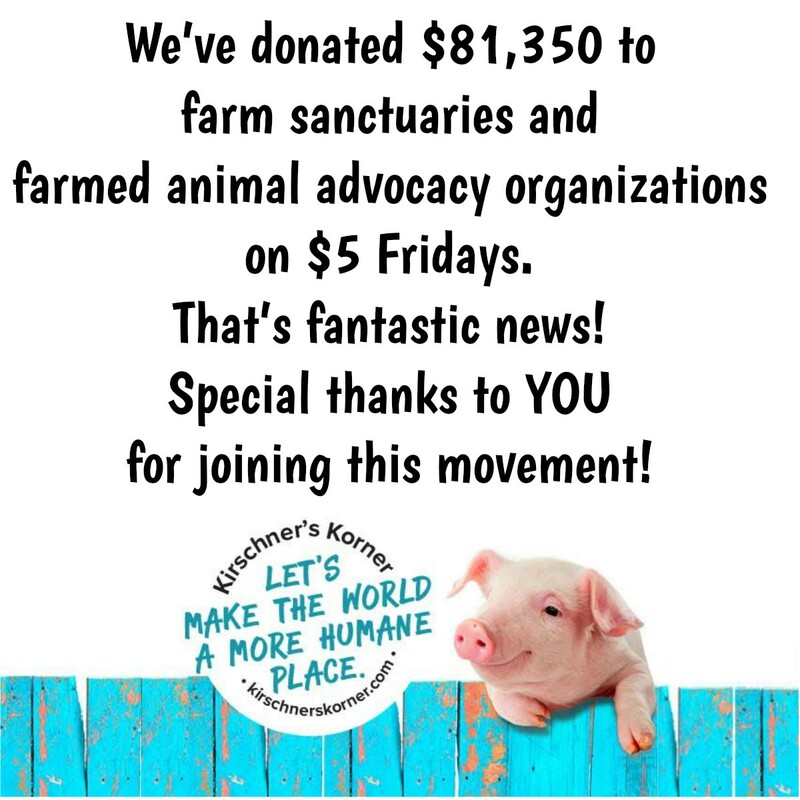 Our new $5 Friday total is an incredible $86,495 donated to farm animal sanctuaries and farm animal advocacy organizations–a victory for animals! We hope to see you all again this Friday for another round of $5 Friday. Thank you so much for your support! Wow! That’s awesome, Andrew! I’m grateful to everyone who donated. That money will go a long way towards helping many animals! And I agree with everything you said about Almira!